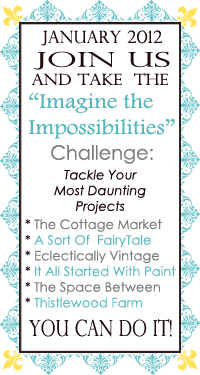 It is about time I did something about your bare walls, so to spur myself forward I am taking part in “Imagine the Impossibilities”. Now as I have said before I am a little bit of a snob as to what I hang up. I like completely unique pieces, but this takes time and I never seem to have enough of it. On a recent indulgence on Pinterest I came across a fabulous piece of string art and I knew as soon as I saw it that I wanted to have a go at making something similar. It is made simply from nails and string. So am off to Home Depot and Jo Ann’s to by some supplies. What are the odds I end up hammering my thumb in this project! This entry was posted in Craft Projects, Rope, String, Wall Art. Bookmark the permalink. Cool – glad you are joining our challenge! I've always wanted to do a string art wall – can't wait to see yours! We are so excited that you and your Chicago House are joining us in this challenge! I think that string art is awesome and I can't wait to see your finished "impossibility." thanks for joining us in the challenge! Wow! I love this project, I can't wait to see how it turns out. Then maybe I'll have to try one myself. Thanks so much for joining our challenge and posting our button! I actually used a plywood board for this project … I thought hammering nails directly into my walls could lead to disaster, the walls might fall to bits, I might hate the finished piece and having recently gone through the whole house selling thing I am sensitive to what realtors require of you to get your house sold …pulling nails out of a wall and patching is not good…not that I am planning on moving again any time soon!